Here’s a beginner’s guide to Asian noodles, which are easy to find these days. Ten years ago, soba, udon, bean-thread and rice stick noodles, among others, were rare finds. Now, many well-stocked supermarkets carry these authentic noodles. Here’s a brief lexicon of the most commonly used varieties. Shown above, Udon Noodle Soup with Crisp Vegetables. 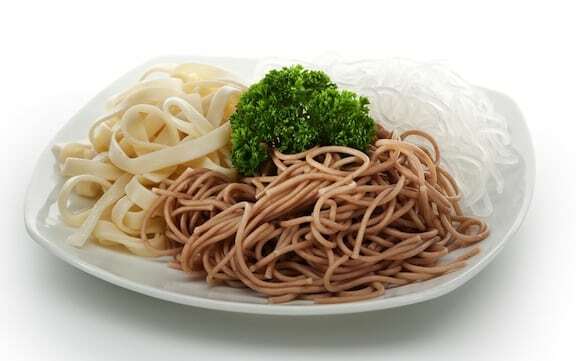 Buckwheat noodles (soba): A spaghetti-shaped noodle combining hearty- tasting buckwheat flour with wheat or whole wheat flour. Buckwheat variations (jinenjo soba, lotus root soba, mugwort soba): These soba noodles contain a mixture of wheat and buckwheat flour plus the ingredient for which they are named. All are delicately flavored. Bean-thread noodles (also called cellophane noodles, harusame, saifun, mung bean noodles): Fine, transparent noodles made of mung bean starch. 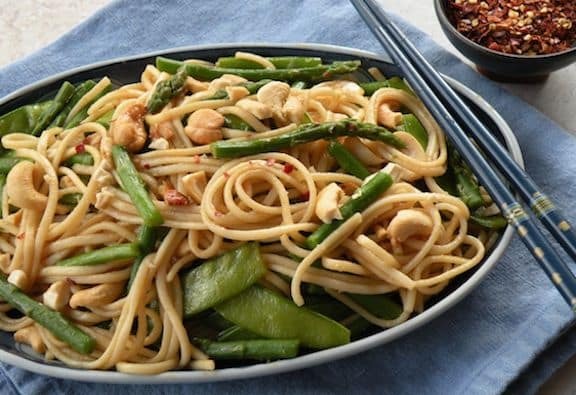 Cooked by soaking in hot water, these delicately flavored, wheat-free noodles come in 2-ounce bundles. Rice-sticks (also called mei fun, bifun, rice vermicelli) and rice noodles: Long, fine noodles made of white rice flour, with the same mild flavor and tender texture of white rice. These are cooked by soaking in hot water. Rice noodles, wider and flatter than rice-sticks, are popular in Thai cookery. Somen: These spaghetti-shaped noodles are imported from Japan, where they are traditionally eaten cold during the summer months. A smooth-textured whole wheat version is available in natural food stores. Udon: Long, somewhat thick noodles akin to linguine. The whole wheat variety of this Japanese import is available in natural food stores and has a smoother texture and milder flavor than domestic whole wheat pastas. 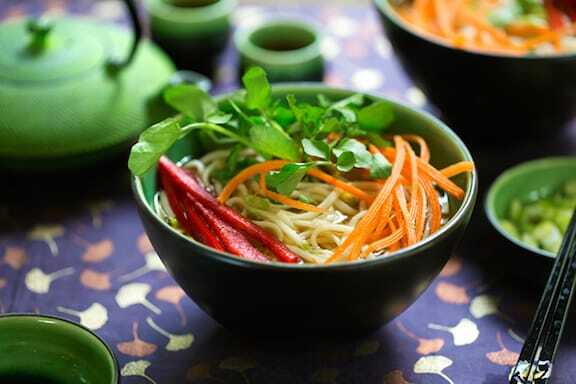 Here is a selection of Easy Asian-Style Noodles Soups. 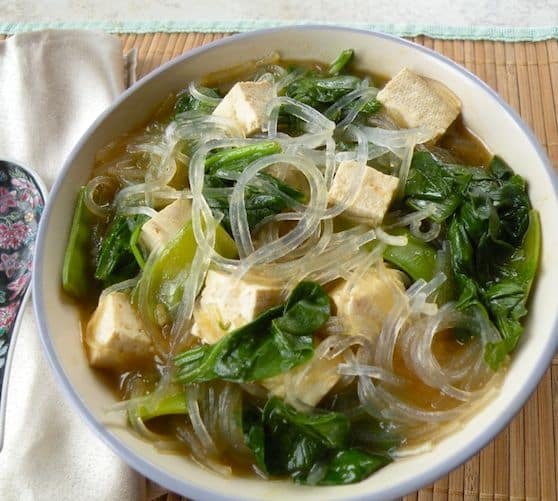 You’ll also find lots of Cold Asian Noodles Dishes. Here are more of VegKitchen’s Natural Food Guides. would you say that all of the above varieties are definitely vegan? I am cooking for a friend who is and would hate to feed her something that doesn’t follow the vegan lifestyle. I am having a hard time because most Asian foods have 99% of the packaging in another language. Hi Leah, I would say that most Asian noodles are naturally vegan, unless of course, they’re egg noodles. Same for domestic pasta. If you’re not sure, you can get several varieties in natural foods stores, and these have packaging that’s in English. How nice of you to want to make something special for your friend!